Again turn the tables back on your own experiences. What made you get into rescue? What was your first experience like with a rescue organization? Maybe you stayed at the first organization you volunteered for and maybe you spun off and started your own. But there are reasons why and those reasons are what you should focus on when thinking about your own volunteer management. Taking a few of Joanne’s suggestions, let’s apply them to animal rescue and make them specific and actionable. They want to learn something new – As we all know, learning new skills and absorbing new information is a part of how we grow in life. What do your volunteers learn from your rescue organization? Do you ask them when they volunteer what they want to learn and pair them up with someone who has more experience to coach and guide them? Do you vary the tasks that you ask them to do in order to give them new opportunities? Maybe you establish a director of volunteer involvement and make that a rotational position so that others get that experience and opportunity to learn how to manage other volunteers. Do you give volunteers the opportunity to participate in the website maintenance or do you limit that to the experts who already know how to manage the site most effectively? 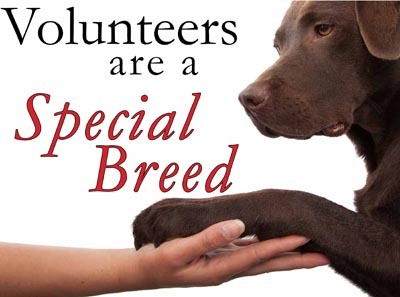 What about conducting fundraisers, coordinating transports or even managing the fosters? These are all skills that are interesting and fun for people to learn and will keep them engaged in your organization for years to come. They want to know that they are helping to make the world a better place. – This one should be easy to do with animal rescue right? By saving lives, they are absolutely making the world a better place and this is likely the reason that they got involved in the first place. So how do you remind them of the positive impact that they are having on a regular basis? Maybe you do a monthly conference call where you discuss the successes of the month and what’s planned for next month. You could have regular reviews of the adoptions that were successful, reviews of incoming animals to the rescue, and open discussions on how your operations are doing. These candid conversations will not only keep your volunteers plugged in but will serve as a source of new ideas and suggestions on how to keep things running smoothly. Spend some time thinking about what is important to your volunteers and maybe do some research on the internet for ideas. There’s a wealth of information and tips out there. What’s your idea? We’d love to hear from you how you keep your volunteers engaged and how you attract new ones.